View of “Alex Da Corte: A Season in He'll,” 2016. As you enter this space, your senses are bombarded by Alex Da Corte’s scrambled, saturated landscape. A supersized witch’s hat fills the first area, lit by green and red neon from above. This is flanked by a stained-glass window depicting a red rose, referencing Disney’s Beauty and the Beast, and a floor-to-ceiling, blown-up image of a weeping bridesmaid. The exhibition is like a dream: Recognizable elements are mashed together, but something is off, and it gradually morphs into a surreal nightmare. The gallery buzzes with sound from three video works—the focal point of the second room—depicting a handsome proxy for the artist unflinchingly performing unpleasant tasks, such as snorting up a raw egg for A Season in Hell, 2012. These actions are shown in slow motion, creating sounds of continuous anticipation. They also feature brightly colored, pastel sets and wardrobe, mimicking the static staging of some weird children’s science-class project or a YouTube tutorial. The three installations, each pumped with a discrete scent, can and should be viewed as separate but related ecologies. The show comes together as a sort of pained smile, a poppy front for more sinister intentions. 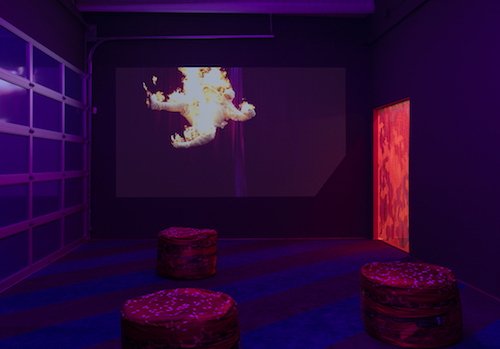 Perhaps the final room best exemplifies this: Bathed in purple light, plush hamburger bean-bag stools function as seats from which to view the video A Night in Hell, Part II, 2014, depicting a looping scene of a burning mummy falling across a theater curtain. This image on endless replay complements the perverse humor running throughout the exhibition. Da Corte plays with the weight, pacing, and scale of objects and images both conceptually and formally, queering their presences and relationships to one another and to the viewer.